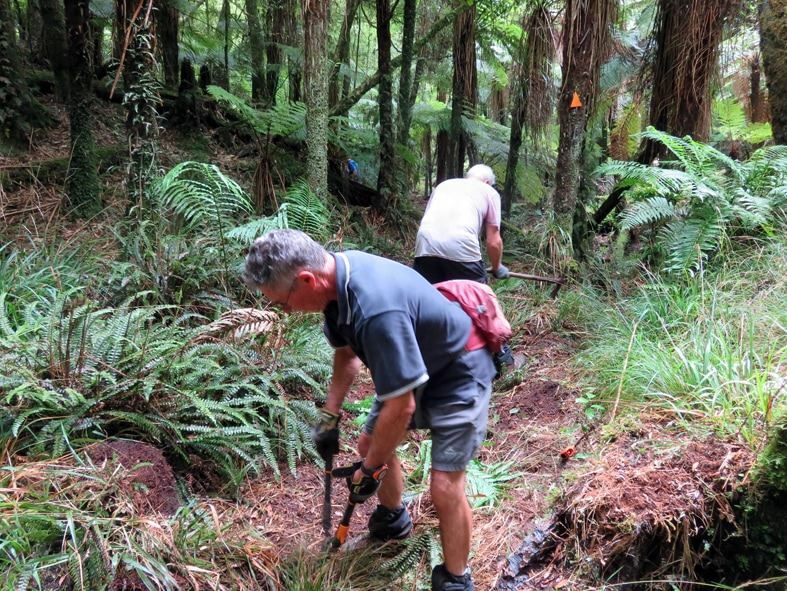 The North Shore Tramping Club has undertaken to clear one of the many tracks in the Kaimai Ranges, which is administered by the Kaimai Ridgeway Trust. Several previous trips undertaken by members have enabled nearly half of the track to be cleared. The track runs north from the top of the Wairere Falls to a junction near Aongatete. Are you able to help on the next trip? The work is not difficult. All you need is some good garden gloves and hedge cutters. It will be an ideal time because the rain has softened the ground, and enable grasses and plants can be pulled out with ease, as we have previously experienced. As there is no cabins, tents are required (available for loan from the club if required). There is an abundance of clean water available in the streams. Is there someone who can loan a GPS to enable a particular site to be located along the track? We have the co-ordinates. As you climb up to the track along a well trodden pathway you can observe the water fall from an observation point (approximately half way up), along with expansive rural views. At the top and start of the track you are able to walk a short distance to the edge of the falls and take in the magnificent rural views to the west. The track we are clearing is easy going and meanders for some time along a river through groves of trees and some open areas. Organiser: For more information, contact Ralph Martin on 022 600 5730 / 09 420 3494, or email Ralph here.